The Arctic blast last week definitely reminded me that we have a little over two months of Winter left. 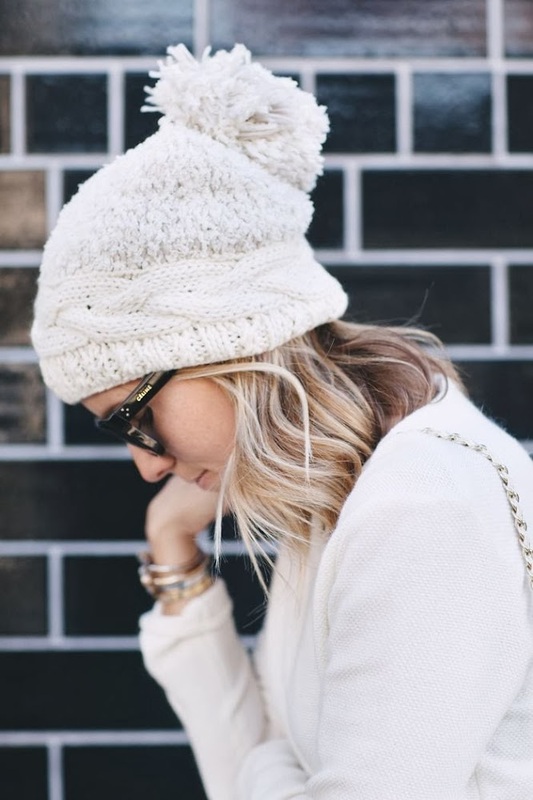 I have always felt kind of awkward wearing hats but with the temperatures set to take another huge dip next week I am considering the need to purchase a couple cute beanies preferably with a pompom. Two adorable and reasonably priced options are this and this. It's definitely too chilly to leave the house without a trusted beanie. :) Love the pics in this post- great winter fashion street style. So cute!! I wish Floridians could wear beanies in our 60 degree weather without looking ridiculous :) Happy Tuesday! My hair does not do well with beanies, but if I was facing such cold weather, I would definitely be purchasing some and not worrying about it! Love your choices- the little pompoms are so cute! I have on beanie with a pom pom on it but haven't worn it yet. I hope you will find your prefect hat. they will definitely keep your head warm and that is very important. Awww.... You've got me really wanting a pompom hat now!! !